JOINT BASE CHARLESTON, S.C. — On Feb. 23, 1991, Army Pfc. Roy Bent­ley was in Sau­di Ara­bia serv­ing with the 2nd Armored Cav­al­ry Reg­i­ment as an armored crew­man when the ground war began dur­ing Oper­a­tion Desert Storm. 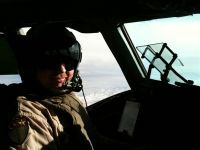 Exact­ly 20 years lat­er, on Feb. 23, 2011, Air Force Maj. Roy Bent­ley land­ed in Kuwait with the 17th Air­lift Squadron en route to his deploy­ment with the 817th Expe­di­tionary Air­lift Squadron — this time as a C-17 pilot sup­port­ing oper­a­tions Endur­ing Free­dom and New Dawn. Air Force Maj. Roy Bent­ley flies a C-17 Globe­mas­ter III in South­west Asia in March 2011. Bent­ley remained on active duty with the Army until July 1992, when he then joined the Army Nation­al Guard and used his GI Bill ben­e­fits to go to col­lege. In 1998, he was accept­ed into the Air Force’s Offi­cer Train­ing School, and he began pilot train­ing in 1999. Today, Bent­ley is a C-17 instruc­tor pilot assigned to the 17th Air­lift Squadron here. He is deployed to Man­as Air Base, Kyr­gyzs­tan, one of three loca­tions where the squadron is based dur­ing this deploy­ment rota­tion. The air mobil­i­ty mis­sion has played a key role in oper­a­tions Iraqi Free­dom, Endur­ing Free­dom and New Dawn. While deployed, the squadron is pro­vid­ing air­lift for troops and pas­sen­gers, mil­i­tary equip­ment, car­go and aeromed­ical air­lift. It also con­ducts mis­sions involv­ing the air­land or air­drop of troops, equip­ment and sup­plies to warfight­ers in aus­tere loca­tions. As some­one who has been on both sides of the coin, Bent­ley said, he knows how impor­tant the air mobil­i­ty mis­sion is and what it can mean to the warfight­er on the ground. While the mis­sion is cer­tain­ly dif­fer­ent this time around for Bent­ley, he has a true appre­ci­a­tion for the ser­vice mem­bers who are on the ground. Look­ing back on his deploy­ment dur­ing the Gulf War, Bent­ley said his time in a tank was much dif­fer­ent from time in a C-17. So how is time spent in a C-17 dif­fer­ent? Dur­ing this cur­rent deploy­ment, Bent­ley is the Detach­ment 2 com­man­der for the squadron at Man­as and has been fly­ing with two of the squadron’s newest pilots. “Being able to pass on my know-how and devel­op­ing the skills of those younger air­men has been reward­ing,” Bent­ley said. Just as it was by chance that Bent­ley land­ed in Kuwait 20 years to the day of the start of the ground war in Oper­a­tion Desert Storm, he’s also leav­ing in the same fash­ion. “I was rede­ployed to Ger­many in May 1991, and I’m slat­ed to return to Charleston in May 2011,” he said. Bentley’s fel­low air­men at Man­as couldn’t let this mile­stone pass with­out a few good-natured jabs.